Mental health disorders are among the most common health conditions faced by Californians: Nearly one in six California adults experiences a mental illness of some kind. One in 13 children have an emotional disturbance that limits participation in daily activities. Meanwhile, Medi-Cal is the major source of coverage for 13 million Californians, including low-income children and their parents, pregnant women, seniors, and nonelderly adults, including people with disabilities. The program also plays a key role in covering mental health care. Catherine Teare, CHCF’s associate director for high-value care, was asked to testify at the February 26 joint hearing to provide an overview of mental health in California. Her comments focused on four areas detailed below, and her complete presentation (PDF) is available for download. The source material was primarily the CHCF publication Mental Health in California: For Too Many, Care Not There, one of CHCF’s 2018 Almanac products. That publication updated a 2013 report on mental health in California, and she spotlighted several trends. 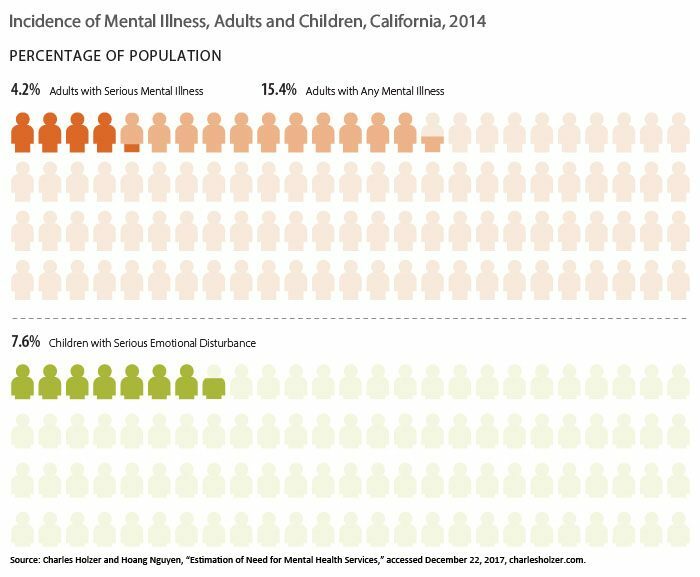 As noted above, nearly one in six California adults experienced a mental illness in 2014 (the most recent year for which we have data). That means they had a mental, behavioral, or emotional disorder. This category includes people whose mental illness causes any degree of functional impairment. In that year, about one in 24 California adults experienced a serious mental illness, which is defined as a diagnosable mental, behavioral, or emotional disorder resulting in functional impairment that interferes with or limits major life activities. Among kids age 17 or younger, one in 13 had a serious emotional disturbance, which is a mental, behavioral, or emotional disorder that substantially limits functioning in family, school, or community activities. These numbers are essentially unchanged from those contained in CHCF’s previous Almanac report on this subject. 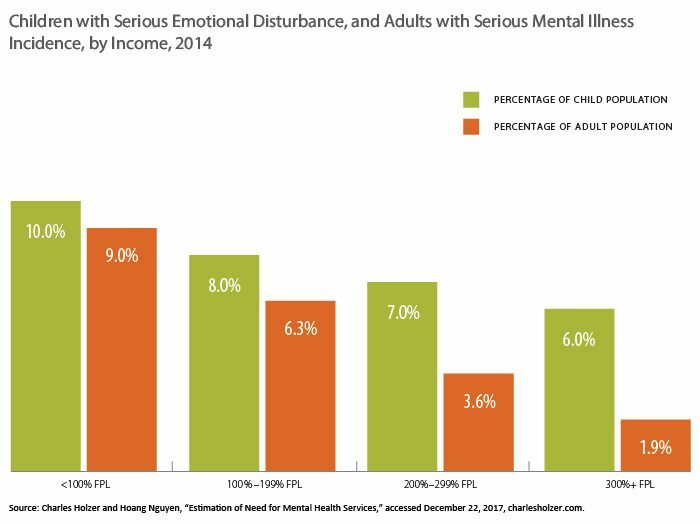 As the chart below shows, serious emotional disturbance in children and serious mental illness in adults is more common among people at the lowest income levels. 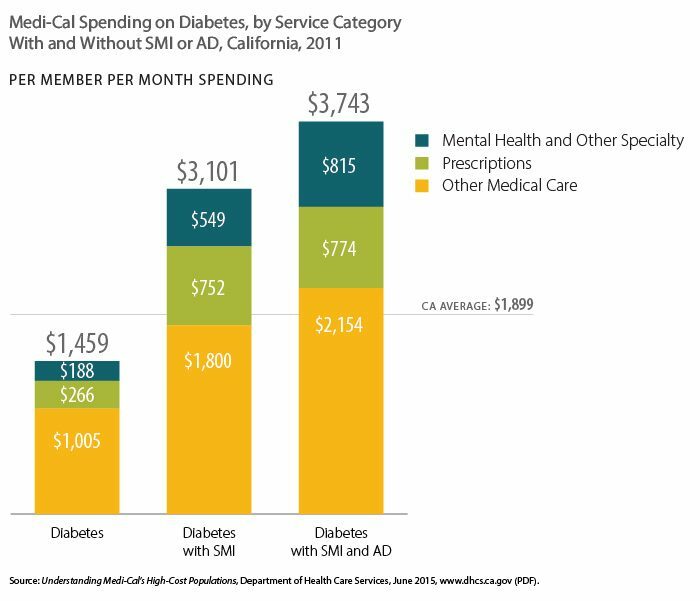 Because eligibility for Medi-Cal is often determined by income, those most at risk for mental illness are also the most likely to be covered by Medi-Cal. Mental illnesses can cost people their lives. Most people who die by suicide have a mental or emotional disorder. People with addiction or other substance use disorders are six times more likely to die by suicide than those without them. California’s suicide rate is lower than the national rate and has been stable since 2011–2014 at approximately 10 to 11 per 100,000 people. 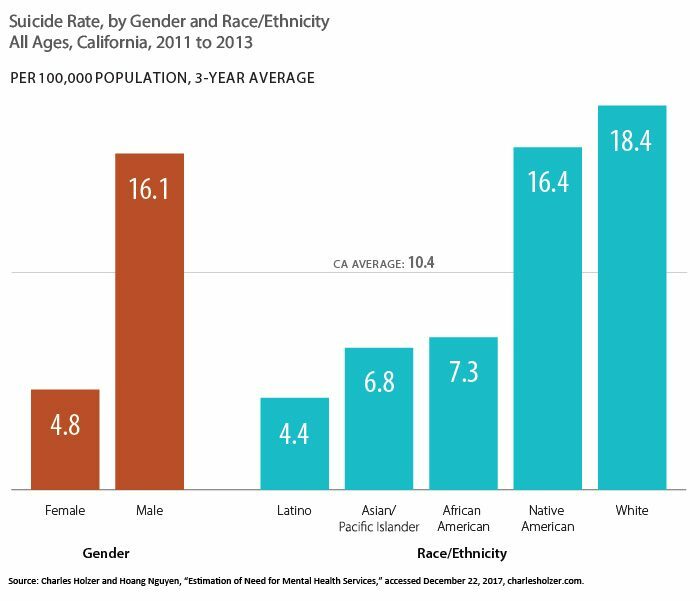 The chart below shows that rates of suicide differ dramatically by gender and race. The rate for men is three times higher than for women. For California, there are significant and concerning gaps in access to mental health care, and the situation has changed little in the last 10 years. 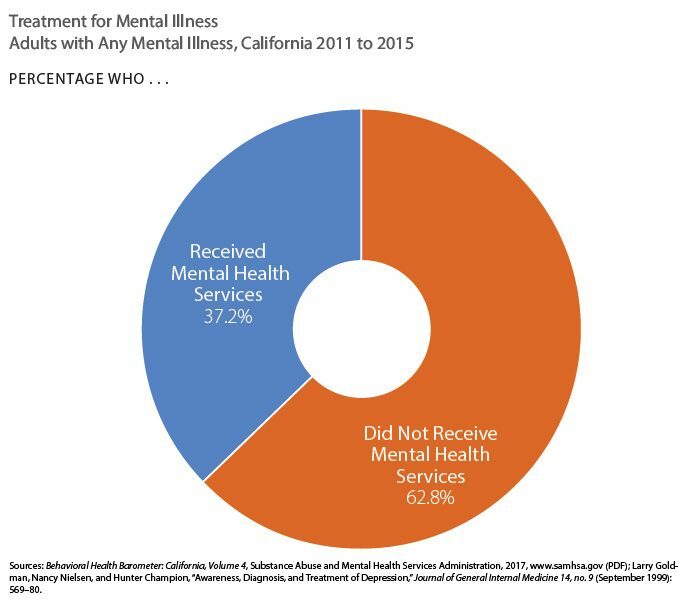 As the following chart shows, only about one-third of California adults with a mental illness received treatment or counseling during the prior year — lower than the national rate of 43%, which is about the same rate as reported in 2013. In the CHCF/Kaiser Family Foundation statewide poll, three in four respondents said treatment is effective in helping people with mental illness lead healthy and productive lives. For adults with major depression, which is associated with higher risks of suicide and cardiovascular death, access is better than for people with other mental illnesses. 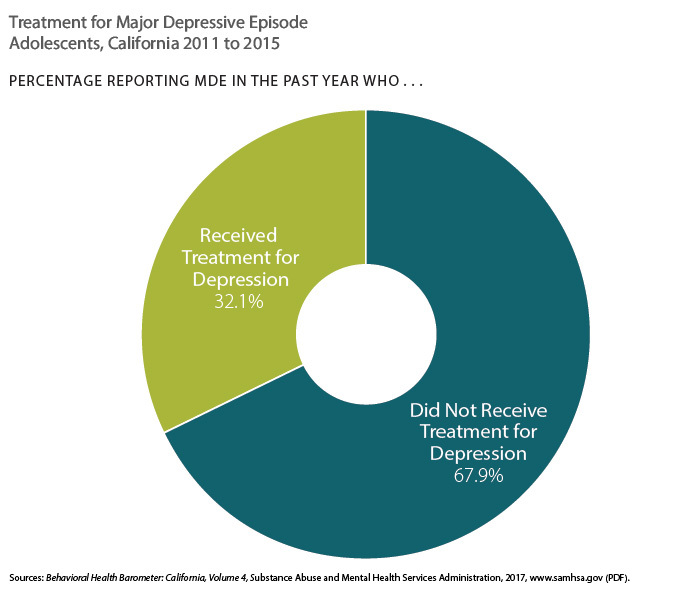 Nearly two-thirds of California adults who report a major depressive episode receive treatment. But for adolescents with depression, the data were starkly different and perhaps the most concerning of Teare’s presentation. In only six years ending in 2014, the share of teens who reported experiencing a major depressive episode rose from 8.2% to 12.3% — a 50% increase. It means one in eight California adolescents reported a major depressive episode. Worse, unlike adults, two-thirds of adolescents with major depression do not receive treatment, as shown in the chart below. This is not reflective of normal adjustments of adolescence, but of teens with major depression. Adults with serious mental illness and children with serious emotional disturbance who are covered by Medi-Cal receive mental health care through their own county’s specialty mental health services program. Under the Affordable Care Act’s Medi-Cal expansion, the number of adults served by these county programs has soared. Because they are now covered by Medi-Cal, they also have access to all Medi-Cal benefits, which is important because people with behavioral health disorders die at a far younger age than those without. We may reflexively think that they die from “unnatural causes” like suicide, overdose, or accidents. But people are much more likely to die earlier of the same causes as everyone else: heart disease, stroke, diabetes, and respiratory problems. These disparities in health outcomes for people with mental health and substance use disorder are reflected on the cost side, too. The next chart shows that total costs of care for Medi-Cal beneficiaries with diabetes and a co-occurring serious mental illness were more than double the amount for people with diabetes alone, and more than 2.5 times higher for patients also diagnosed with a substance use disorder. What’s significant is that the increased costs are mostly for physical health services, not additional treatments for mental illness or substance use disorder. The data Teare presented to lawmakers that focused on prevalence, costs, and utilization don’t do a good job of telling people’s stories. Every day in California, people with mental illness go to work, care for their families, and participate in their communities. Mental health providers across the state are working to provide care for people in need. Yet, too many in our state are suffering and missing out on treatment. The data create an inescapable conclusion: Our health care systems don’t make it easy for those who need care to actually get it. Lisa Aliferis is the senior communications officer for CHCF’s High-Value Care team, which supports policies and care models that align with patient preferences, are proven effective, and are affordable. Lisa came to the foundation after working as a health journalist for 25 years, most recently at KQED News in San Francisco, where she was founding editor of State of Health, a daily blog focusing on health policy and public health in California. She conceptualized and wrote KQED’s popular consumer resource Obamacare Explained: A Guide for Californians. Lisa’s work has also been published by NPR’s Shots, Kaiser Health News, and JAMA Internal Medicine. She has produced television news health stories for many outlets, including Dateline NBC. Lisa holds a bachelor’s degree in economics from Brown University. As part of her year as a Kaiser Family Foundation Media Fellow in Health, she completed graduate courses at the University of California, Berkeley, School of Public Health.